Visa to Cambodia, Laos and Thailand is easier to obtain now, you could apply for visa at the arrival airport, while apply visa to Vietnam and Myanmar is bit more complicated. 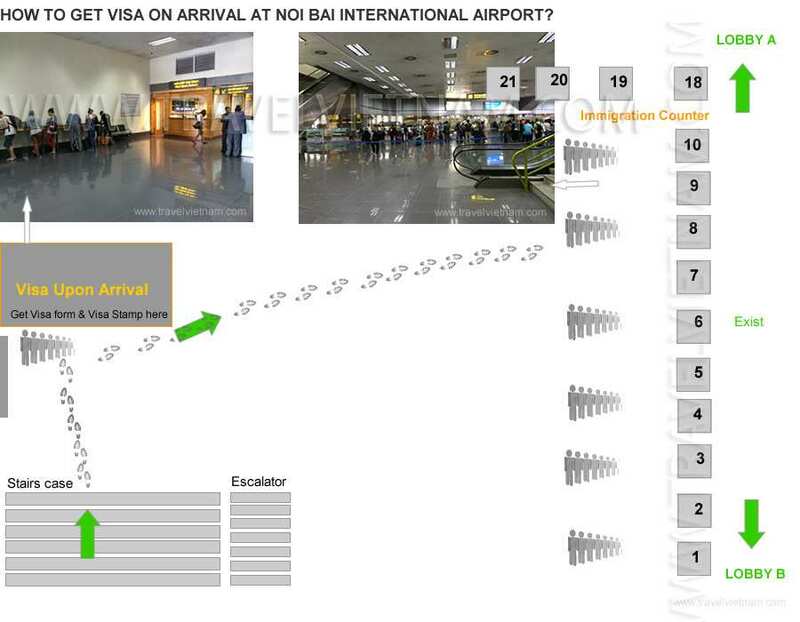 Visitors have to apply Visa in advance to enter Myanmar and Vietnam. Below are some information about Visa to these countries. For more information, please contact one of our Travel Consultants for instant support and worthy travel advisory. - Chilean holders of ordinary passports with a validity of at least six months are subject to a visa-free stay in Vietnam shorter than 90 days. Travelers with Vietnam Tour receive a complimentary Visa Approval Letter to make your trip a little easier! A Travel consultant will prepare the necessary paperwork and send you the letter either by email or fax. An electronic visa (E-visa) is one of visa types issued to foreigners by Vietnamese Immigration Department visa electronic system. Vietnam E-visa is valid for maximum of 30 days, single entry. Outside Vietnam foreigners who want to enter Vietnam can personally apply for E-visa or through the inviting/ guaranteeing agencies and organizations. E-visa fee (25 USD) is paid via electronic payment gateway as prescribed by the Immigration Department. The fee will not be refunded in case the applicant is refused to grant e-visa. Applicants are required to complete a form available on two separate websites (one in Vietnamese and the other in English) run by the Ministry of Public Security. It takes three working days for tourists to find out if their applications have been approved or not, according to the directive. Successful applicants will be able to print off their e-visas to present when they arrive. Visitors can touch down at any of Vietnam's eight international airports, including Tan Son Nhat in Ho Chi Minh City, Noi Bai in Hanoi and Da Nang in the central region. Visitors can also arrive via land at 13 international border gates, and via sea at seven ports across the country. - Not falling into the cases of suspension from entry prescribed in Article 21 of Law on foreigners' entry into, exit from, transit through, residence in Vietnam. 3. For airlines, click here. E-visa holders in Vietnam may be considered to grant new visa if being invited/guaranteed by authority/ organization/ individual in Vietnam in accordance with Law on foreigners' entry into, exit from, transit through, residence in Vietnam. - Indonesia, Malaysia, Singapore, Laos and Vietnam (30 days). - Thailand, Myanmar, Brunei, Seychelles (14 days). 2. Visa to Cambodia can be applied at ports of entry whether you come by air or by land. Travelers are required to show your photo (3x4cm) and their valid passport. The Government Immigration distributes application forms upon arrival. - If you arrive by air at Phnompenh International Airport or Siem Reap International Airport, it is very simple and just takes you few minutes to get visa done. The fee is 30 USD for a 30 day visa (Cash only). - Obtaining a Cambodian visa is also possible at the Poit Pet border gate with Thailand (When you drive in from Thailand). - From Vietnam you can enter to Cambodia via few border gates: Kaam Samnor in Prey Veng-Kandal Province or Vinh Suong at Chau Doc (Mostly people come by boat), Prek Chak in Kampot Province or Xa Xia at Ha Tien, Bavet in Svay Rieng Province or Moc Bai at Tay Ninh when you drive from Ho Chi Minh City. The Visa fee is 33 USD/ single entry. 3. A visa on arrival, valid for a thirty-day stay, is specifically granted at Phnom Penh International Airport, Siem Reap International Airport, and International Border Checkpoints. Visas are also granted at Royal Cambodian Embassy or Consulate abroad. The visa fee for a tourist is US$20, and the visa fee for a businessman is US$25. Visas can be extended at the Immigration Department in Phnom Penh City. A free visa (K) is expressly granted to the Cambodian living overseas. 4. Cambodia E-visa is now also available. - All you have to do is complete the online application form available at the official website, pay by credit card online, and include uploading a recent passport-size photo in JPEG/ PNG format. The visa will be approved within three business days, allowing you to breeze by that lengthy line and get a jump-start on your holiday. - The Cambodia e-visa, valid for a thirty-day stay, is available only for a typical tourist visa for a single entry. It is currently not available for nationals from Iran, Iraq, Pakistan, Afghanistan, Bangladesh, Arab Saudi, Algeria, Sudan (it means citizens of these countries must obtain visa at embassy). For a business visa, please apply at your nearest embassy or on arrival at all major check points. - Tourists getting such a visa online can enter and exit Cambodia through Phnom Penh International Airport, Siem Reap International Airport, Sihanoukeville International Airport, Bavet International Border Checkpoint in Svay Rieng, Cham Yeam International Border Checkpoint in Koh Kong, Poipet International Border Checkpoint in Banteay Meanchey, and Tropaeng Kreal Border Post Stung Treng. • Wattay International Airport in Vientiane Capital. • Luang Prabang International Airport in Luang Prabang Province. • Pakse Internatioanl Airport in Champasack Province. • Savannakhet International Airport in Savannakhet Province. • Mohan - Botene , Yunnan to Luang Namtha Province. • Chiangkhong - Houixay, Chiang Rai to Bokeo Province. • Nakaxeng - Kaenthao, Loei to Sayabouly Province. • Houi Koln – Nam Ngeun, Nan to Sayabouly Province. • Lao-Thai Friendship Bridge I, Nongkhay-Vientiane Capital. • Lao-Thai Friendship Bridge II, Moukdahan-Savannakhet Province. • Lao-Thai Friendship Bridge III, Nakorn Phanom-Khammouane Province. • Chongmek - Vangtao, Ubol Ratchathani to Champasack Province. • Pang Hok - Tay Trang, Dien Bien Phu to Muang Khua and Luang Prabang. • Nameo - Banleui, Thanh Hoa to Huaphanh Province. • Namkan - Nam Can, Nghe An to Xieng Khouang Province. • Keoneua - Nampao (Lak Sao), Ha Tinh to Bolikhamxay Province. • Lao Bao - Dansavanh, Quang Tri to Savannakhet Province. • Dong Calor - Veun Kham, Cambodia to Champasack Province. WHO CAN GET LAO VISA-ON-ARRIVAL? WHO CAN'T GET LAO VISA-ON-ARRIVAL? Travelers holding passports from the following countries are not eligible for Laos visas on arrival: Afghanistan, Algeria, Bangladesh, Burundi, Cameroon, Congo, Cote d'Ivoire, Ghana, Guinea, Guinea Bissau, Jordan, Lesotho, Liberia, Libya (Libyan Arab Jamahiriya), Mozambique, Nauru, Niger, Nigeria, Pakistan, Senegal, Sierra Leone, Suriname, Syria (Syrian Arab republic), Swaziland, Tonga, Turkey, Zambia, Zimbabwe. According to notice No. 1232 issued on 1 October 2009, by the Ministry of Foreign Affairs of Lao PDR, nationals on the list above must obtain their visas at Lao Embassies or Lao Consulates abroad before enting Laos. However, there is an exception for those nationals who are on official visits and holding a guarantee from the Ministry of Foreign Affairs of Lao PDR. - Your original passport with at least 6 months of remaining validity and a blank page for a visa sticker. - A Visa Application Form, filled out and signed by the applicant (available at visa window at Lao ports of entry or given before landing if you are arriving by plane). - Two (2) recent passport-type photographs (If you are unprepared (cannot provide the photo) there will be an extra fee (few dollars) for scanning your photograph from your passport, and placing it onto your visa application form). - Visa fee (in cash). The cost of Laos Visa depends on which passport you are holding. The price list is on display at the visa counter. If you are citizen of USA, UK or European citizen, the fee is 35 USD, Canadian: 42 USD, Sweden: 31 USD. Note: On weekends, Lao public holidays, before 8 A.M and after 4 P.M weekdays, there is a $1 over time fee. In addition an entry fee (2,500 Kip or so) may be charged. 1. E-visa Online System is currently available to tourists from 100 countries and Taiwan. (c) You will need your Visa, Master or American Express credit cards for the payment of 50 USD (normal process) or 56 USD (express process). 4. If the applicant has child(ren) under (7) years old on the same passport, you have to put the name of that child, date of birth in the minor section of the application form. 5. Tourists must stay in registered hotels, motels, inns, guest house and resort during your stay in Myanmar. 6. The applicant should complete individual personal data whether passenger is FIT or package tour. 7. E-Visa is only valid for a single entry. Re-entry will require a new visa. 9. If you are visiting Myanmar via cruise, please contact our travel consultant for Pre-arrangement Visa on Arrival. You will not be able to use E-Visa to enter Myanmar via seaport. 10. If the decision is not allowed to entry, you may return by the same flight. 11. Ordinary passport holders from the following countries are giving visa exemption for 14 days. Japan & Korean tourists get visa exemption from 1st Oct 2018 until 30th Sep 2019. (a) they are nationals of countries which are exempted from visa requirements when entering Thailand for tourism purposes. Such nationals will be permitted to stay in the Kingdom for a period of not exceeding 30 days. (b) they are nationals of countries which hold bilateral agreements with Thailand on the exemption of visa requirements. 3. To apply for a visa, a foreigner must possess a valid passport or travel document that is recognised by the Royal Thai Government and comply with the conditions set forth in the Immigration Act of Thailand B.E.2522 (1979) and its relevant regulations. In addition, the visa applicant must be outside of Thailand at the time of application. The applicant will be issued with a type of visa in accordance to his or her purpose of visit. 4. In general, applicants are required to apply for a visa in person. However, Royal Thai Embassies and Royal Thai Consulates-General in some countries and in some cases may also accept applications sent through representatives, authorised travel agencies or by post. Please enquire at the Royal Thai Embassy or Royal Thai Consulate-General where you intend to submit your application of acceptable ways of application. 5. Please note that the period of visa validity is different from the period of stay. Visa validity is the period during which a visa can be used to enter Thailand. In general, the validity of a visa is 3 months, but in some cases, visas may be issued to be valid for 6 months, 1 year or 3 years. The validity of a visa is granted with discretion by the Royal Thai Embassy or Royal Thai Consulate-General and is displayed on the visa sticker. 6. On the other hand, the period of stay is granted by an immigration officer upon arrival at the port of entry and in accordance with the type of visa. For example, the period of stay for a transit visa is not exceeding 30 days, for a tourist visa is not exceeding 60 days and for a non-immigrant visa is not exceeding 90 days from the arrival date. The period of stay granted by the immigration officer is displayed on the arrival stamp. Travellers who wish to stay longer than such period may apply for extension of stay at offices of the Immigration Bureau in Bangkok, located at Government Center B, Chaengwattana Soi 7, Laksi, Bangkok 10210, Tel 0-2141-9889 or at an Immigration office located in the provinces. (a) Hold the citizenship of a country on the list issued by the minister under the consent of the Council of Ministers of Thailand. (b) Aim to enter Thailand for tourism for the period of not exceeding 15 days. (c) Submit one headshot photo taken no longer than 6 months. (d) Does not fall into the category of aliens prohibited from entering Thailand under the Immigration law. (e) Possess the return ticket (flight) within 15 days. Open tickets do not qualify. Travelling overland out of Thailand by train, bus, etc to Cambodia, Laos, Malaysia (including en route to Singapore), Myanmar, etc is not accepted as proof of exiting Thailand. (f) Truthfully notify the verifiable places to stay in Thailand. (g) Present evidence of adequate finance, not less than 10,000 Baht (250US$) per person and 20,000 Baht (500US$) per family. (h) Possess a passport or travel document with validity not less than 6 months. (i) A fee of 2,000 THB is payable upon entry and is subject to change without notice. It must be paid in cash and Thai currency only.